POMPANO BEACH, Fla. – South Florida community association law firm Kaye & Bender P.L. has named Jonathan Picard, a second year student at the Shepard Broad Law Center at Nova Southeastern University and resident of West Palm Beach, the recipient of the 2011-2012 Kaye & Bender Scholarship. To be eligible for the $2,500 annual Kaye & Bender Scholarship, students must be a second or third year full-time, or fourth year evening student at Nova Southeastern who is in good standing with a grade point average above a 3.0, demonstrate community involvement and have prepared an essay on the challenges facing community associations in South Florida. 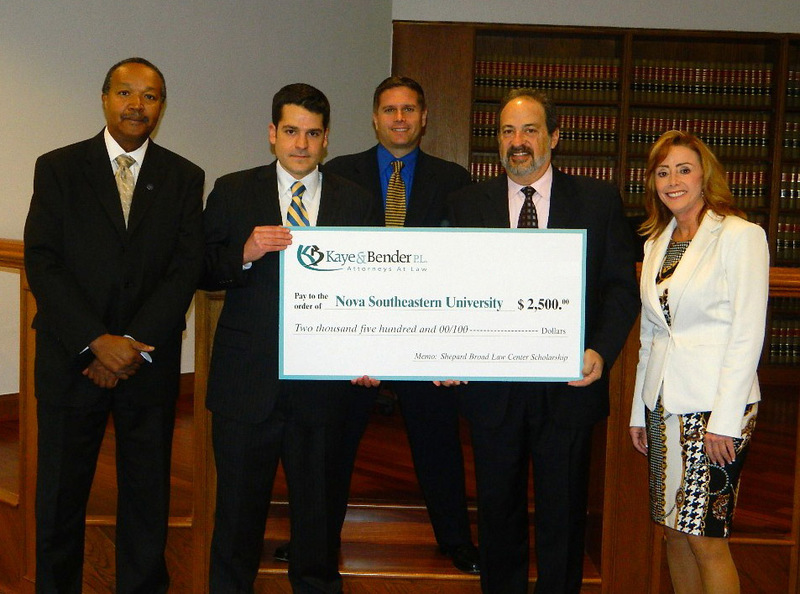 “We appreciate the generosity of Kaye & Bender in creating this scholarship and value their ongoing partnership with the law school,” said Athornia Steele, dean of the Shepard Broad Law Center at Nova Southeastern University. Kaye & Bender provides legal services to more than 800 associations throughout Broward, Miami-Dade, Palm Beach and Monroe counties. For more information, visit KayeBenderLaw.com or call 954-928-0680. From left to right: Athornia Steele, dean of the Shepard Broad Law Center at Nova Southeastern University; Jonathan Picard, winner of this year’s Kaye & Bender Scholarship; Michael Bender, firm member at Kaye & Bender; Robert Kaye, managing member at Kaye & Bender; and Rebecca Allen, director of donor relations and stewardship at Shepard Broad Law Center at Nova Southeastern University.